Happy Thanksgiving! 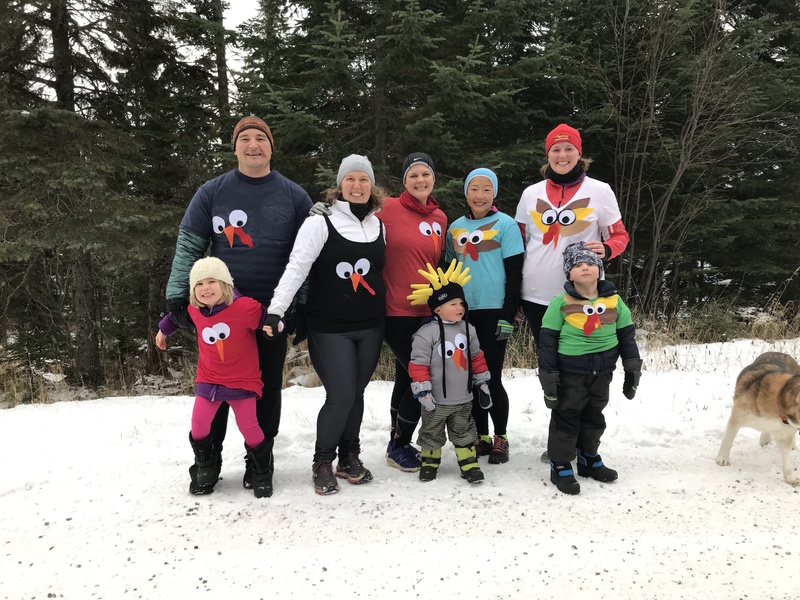 We started the day with Voyageur Brewing Company’s Gobble Gobble Fun Run. Participants were asked to bring a monetary donation for the local food shelf and in return they received a token for a 9-ounce beer in the taproom. We had a great turnout of around fifty people who together raised almost $250. We’re looking forward to a full weekend of events in Grand Marais. There’s the Oh Ole Night Parade on Friday followed by the tree lighting and fireworks. At Voyageur we’re having our own lighting ceremony, firework viewing from the rooftop and free hot cocoa & cider after the parade. 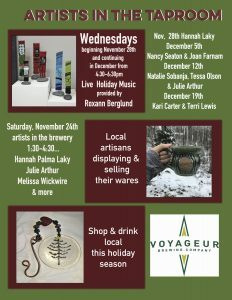 Join us for Shop Small Business Saturday at Voyageur Brewing Company. Not only do we have gift cards and a great selection of gifts but also artisans will be set up in the brewery space from 1:30-4:30pm. On Sunday we’ll have the Vikings game on and the prize wheel out. Each time the Vikings score folks in the brewery have a chance to win. Come cheer on the Vikings as they take on the Packers beginning at 7:20pm. Beginning Wednesday, November 28th and each Wednesday until Christmas we’ll have live holiday music by Roxann Berglund and artisans in the taproom from 4:30-6:30pm. 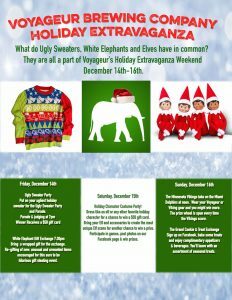 Make plans to be in Grand Marais December 14-16th during the Dark Sky Festival and Voyageur’s Holiday Extravaganza. We have a full schedule of events including an Ugly Sweater Party, Holiday Character costume contest, Grand Cookie Exchange and more. The UMD Geodome will be set up in the brewery and we’ll have telescopes on the rooftop for stargazing. Check out our Facebook Page for more details on all of the events. We have a great selection of beers on tap in the taproom. In addition to our four flagship beers we have our Brule River Blonde, Sledhound Session IPA, Lost Compass British Imperial Stout, Mexican Porter and we’re re-releasing Thirsty Camper Vienna today. We hope you have a wonderful Thanksgiving and holiday season.